“It’s a festival about fish someone said, what are you going down there for?” “Because I like fish” I replied and therefore the decision was made! 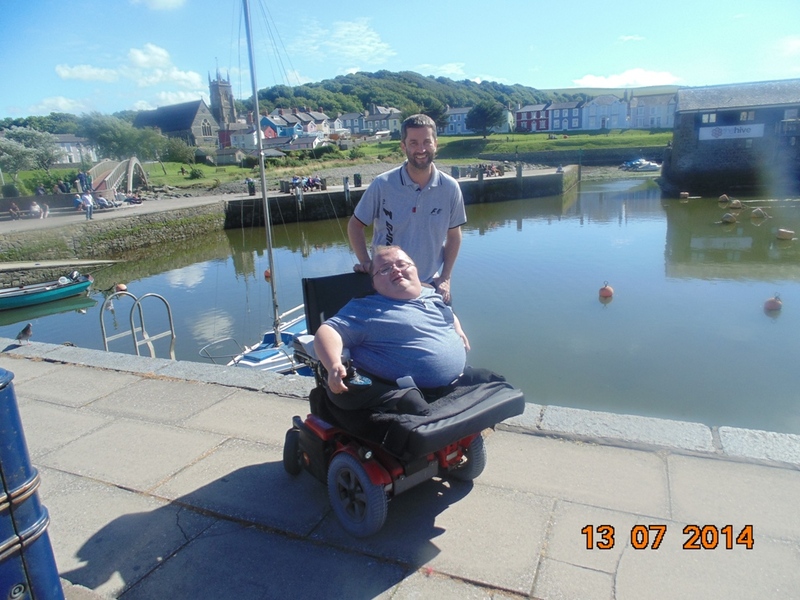 On Sunday 13th July my mate Greg and I visited the Aberaeron Fish Festival and I can honestly say we were pleasantly surprised by what we found. I don’t think the festival’s marketing does it justice at all, from what we’d read online we were expecting some small low key event (almost like a farmers market) – boy were we wrong! 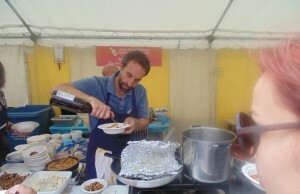 There were hundreds of people and stalls from some exceptionally good producers and some fantastic chefs. The festival was a shining light for welsh food producers and the fantastic and diverse fish we have in our seas. I can’t stress enough how good the food was, and along with top quality food the prices were excellent. 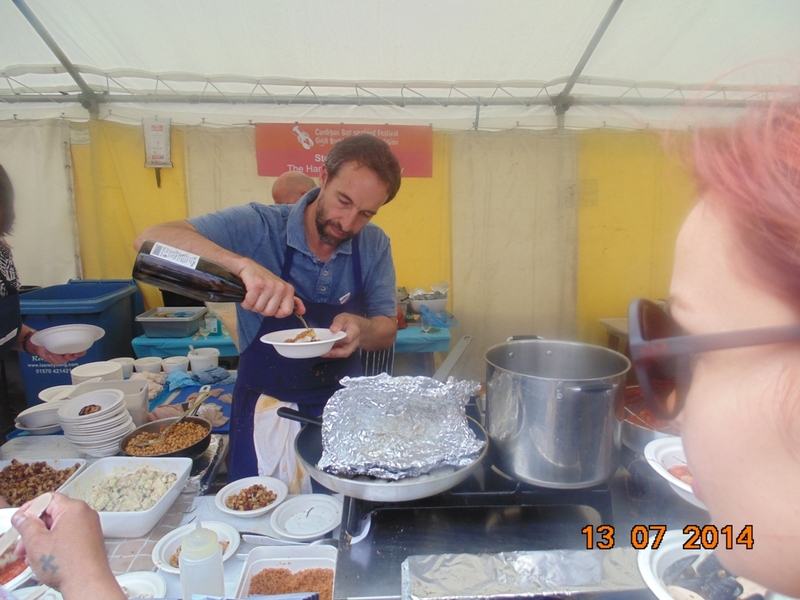 Food from the chef’s stalls was priced at £2.50 and for that you can’t go wrong. 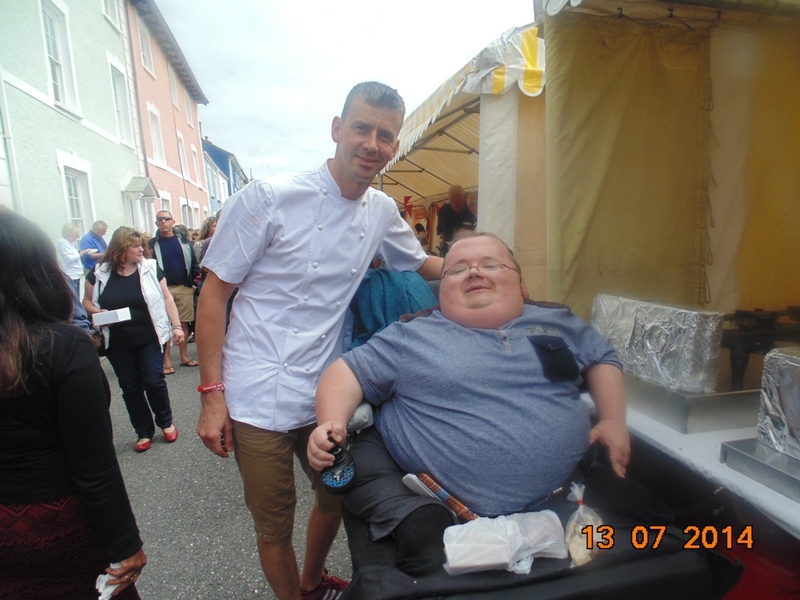 The highlight of my day was having the opportunity to meet Stephen Terry (The Hardwick, Abergavenny), Will Holland (Coast, Saundersfoot) Dudley Newbury (S4C and BBC Wales Chef) and Hywel Jones (Lucknam Park, Bath). 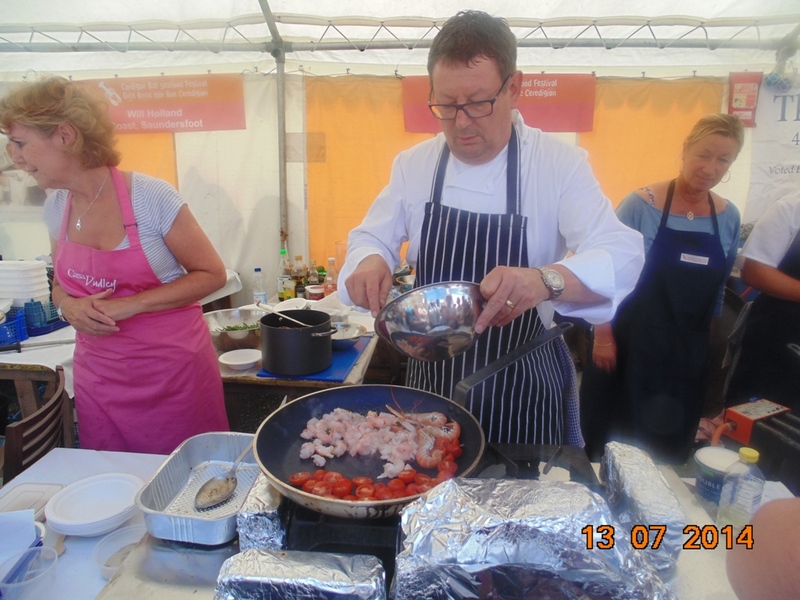 I’ve been to other food festivals where chef’s give demonstrations and are up on a stage but not at Aberaeron these chef’s were on the front line cooking and chatting to people, Will Holland said they’d been cooking for four hours straight and had turned out 1000 plates of food. 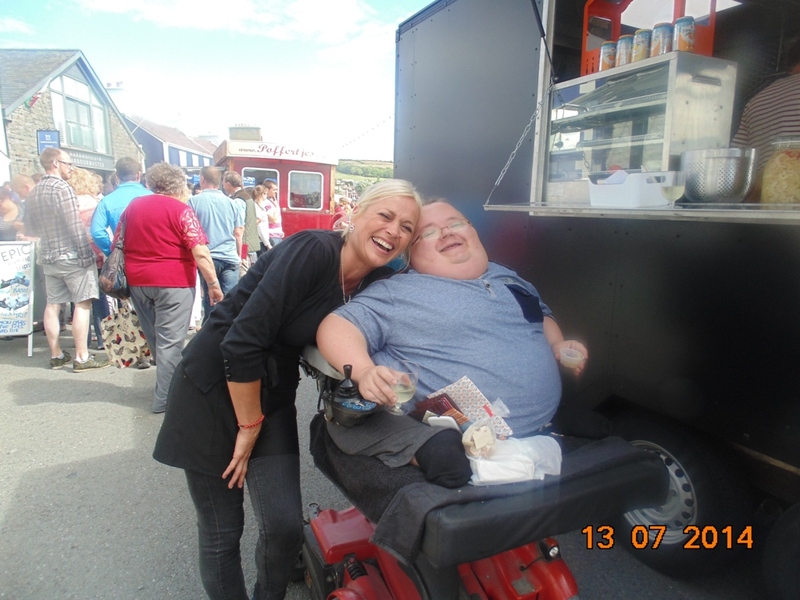 We spent a fair bit on some top quality foods, we had food at Stephen Terry’s stall (I had pasta, potato salad and Greg had a bean salad both topped with a piece of fish) and at Dudley’s stall we had a risotto with langoustines. I also tried some orgasmic pickled celery from Dirty Bird Fried Chicken Food Truck, definitely one of the best things I’ve put in my mouth. 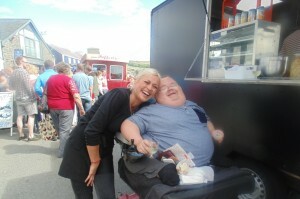 Lara from Dirty Bird Fried Chicken Food Truck and I… Love Her Dirty Picked Celery! 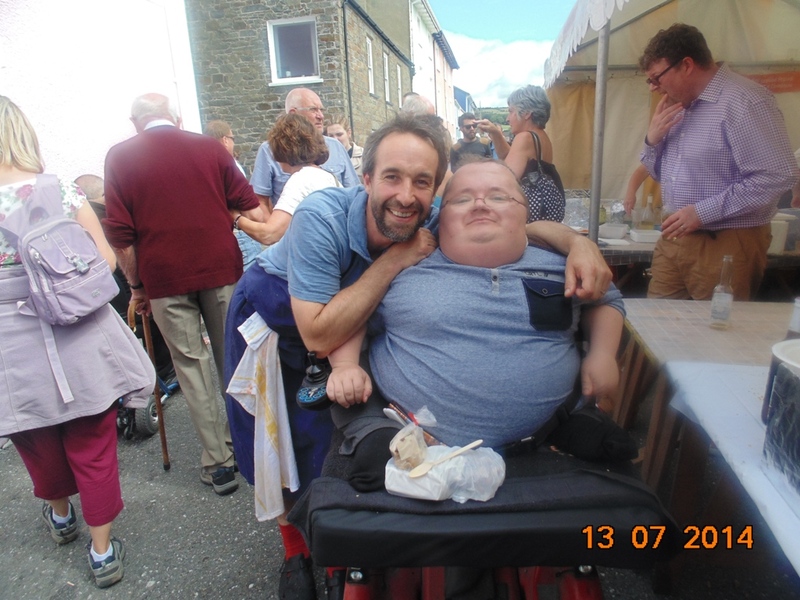 It was especially great to meet Stephen Terry, like Jo Pratt, he’s someone who I have chatted with via twitter over the last few years. 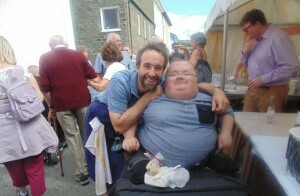 It was great to meet him and great that he remembered me from twitter (I suppose I’m not hard to recognise). I can’t wait for Greg, my mother and I to visit The Hardwick. 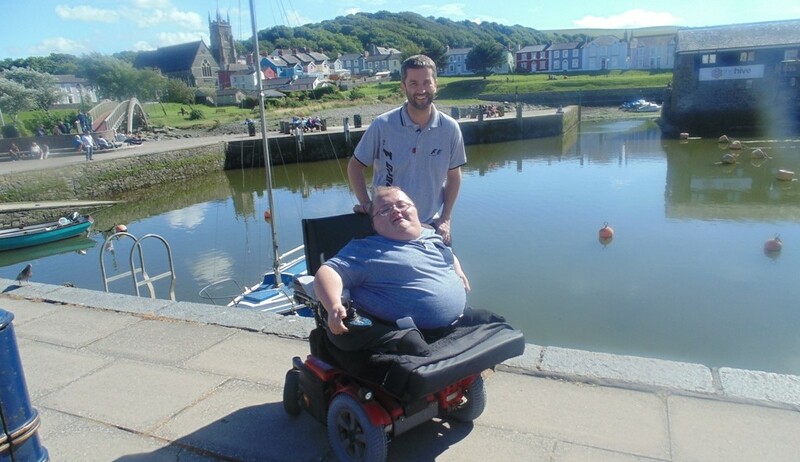 It was also great to meet Will Holland, who I’d recently tweeted, he was great to talk to and I will most certainly be visiting his restaurant The Coast in Saundersfoot. Massive congratulations to all those who organised the festival and all those that took part. The only changes I’d make would be more bins for rubbish and a better use of the stage. I thought the stage idea was excellent but felt more could be made of it and I also had difficulty hearing what the speakers on the stage were saying at one point. I must also add I really liked the idea of music at the end that really added to the party atmosphere, it was good to see talented Aberdare boy Chris Summerhill performing too. Special thanks to Greg for a) the company and b) the driving expertise… even if we were accompanied by a Jamaican Man on his Sat Nav!!! 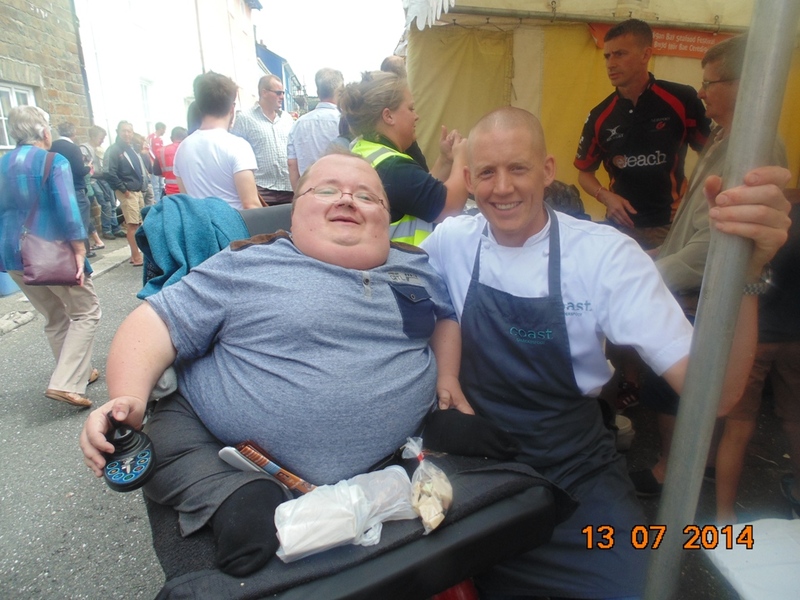 Don’t forget to get involved with Wheelie Good Meals, you can see more pictures on our Instagram, Twitter, Youtube, Google+ and Pintrest pages. I want to see your ideas for what dishes you want me to cook or places you think I should visit. 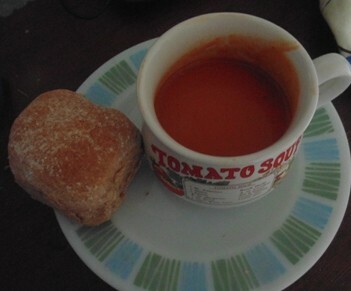 Remember to upload any pictures of our dishes you’ve cooked. 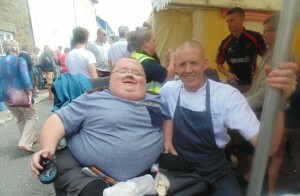 As always if you have any questions you’d like to ask about either myself or the Wheelie Good Meals concept please feel free to drop us a line on enquiries@wheeliegoodmeals.co.uk. 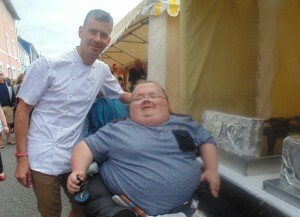 Come back again soon and, together, we’ll make more Wheelie Good Meals!